For anyone who is anxious to escape to sandy shores, exotic foods and rich culture & traditions, Paguera, Majorca might just be the perfect location for you. Located along the breaking waves of Majorca's south-west coast, Paguera is known for attracting its visitors out into its crystal-clear waters once they have enjoyed everything that the land has to offer. A selection of boat trips are offered throughout the day, and these include glass-bottom cruises which take passengers to Dragonera Island. On this scenic piece of land, people can visit Dragonera Natural Park where the 4km-long natural rock formation resembles the arching back of a mythical creature, taking one's breath away. Designated a natural conservation area in 1995, the park has a small museum and the remains of an ancient Roman settlement. Once back on the shores of Paguera, visitors can choose from three different beaches; Playa Palmira (also known as 'Playa de Paguera') Playa de Torà and Playa La Romana. All of which are known to become busy during summer months, but even so, these beaches are known to always be kept clean. Many of the intriguing destinations that surround these beaches are within walking distance of the main resorts that comprise the coastline activity. Camp de Mar retreat is a short walk away, which allows people to get a great view of the mountain-tops that paint the surroundings to this exclusive resort area. The marina designated for this resort is known to be quite luxurious indeed. The attractions for visitors in large venues on this island destination are always ones with international appeal. 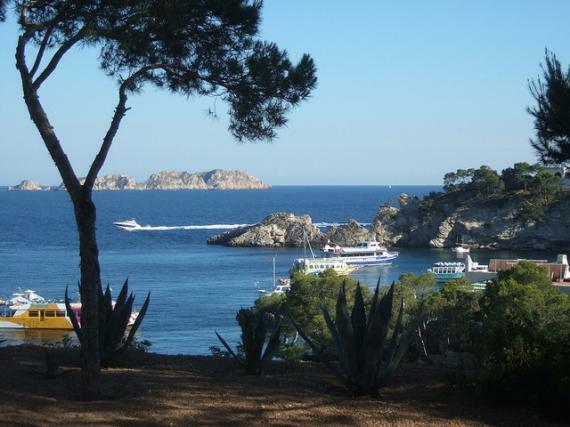 On the south of Paguera's main island are the outskirts of notorious Magaluf, home to the El Pirates dinner and theatre production. Performances are put on nearly every evening as attendees enjoy local & delicious cuisine that is native to the area. This family-friendly stage show gives a true taste of both the past & current culture of the Majorcan people. In Paguera itself, the Globo Balear Theatre is a popular stop for travellers who have a very special night out in mind. The hottest Broadway productions to hit the stage always tend to make their way to this charming theatre. The latest show to draw the attention of audiences was 'Come Fly with Me', a unique production which combines the music of Frank Sinatra with the visual performances of Cirque De Soleil. Visitors to Paguera will find no difficulties getting around once they have arrived. Public transportation is reliable, and buses run to various popular locations every half an hour. Find information about selected Hotels, apartments and rooms in Paguera to choose the perfect place for your accommodation.